TEA BENEFIT Green tea helps burn fat: It can help speed up the metabolic rate because its antioxidant effect helps the liver to function more efficiently. Green tea drinkers also find that their energy levels are greatly increased. Green tea protects against heart disease: It has been shown to lower LDL (bad) cholesterol, because its potent antioxidant effects inhibit the oxidation of LDL cholesterol in the arteries. The formation of abnormal blood clots (thrombosis) is the leading cause of heart attack and stroke, and green tea has been shown to inhibit abnormal blood clot formation. 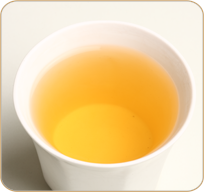 DESCRIPTION A pleasant, smooth green tea with long leaf and yellow infusion. It has a fresh, vegetal aroma and a clean and slightly astringent palate. Best without milk or sugar.